The Aranui 5 is luxurious, exciting, different and memorable. IT'S one of those truly memorable trips; cruising comfortably around the isolated Marquesas archipelago on a working cargo ship. The 125-metre Arauni has 20 scheduled cruises 2020. Most will be the 13-day round trip voyage from Papeete to Hiva Oa, Nuka Hiva, Ua Pou, Ua Huka, Tahuata, and Fatu Hiva in the Marquesas; Bora Bora in the Society Islands; and Rangiroa and Fakarava in the Tuamotus. This is no ordinary small ship experience. In each port while passengers go ashore to experience the French Polynesian culture and history through complimentary guided excursions including hikes, 4WD tours, local feasts and visits to archaeological sites. Included is a fabulous picnic on a secluded island in Bora Bora's blue lagoon. The island scenery is spectacular with soaring hills dropping steeply into the deep, deep Pacific Ocean. On some islands there is the chance to get an authentic Polynesian tattoo and buy beautiful farmed Tahitian pearls. 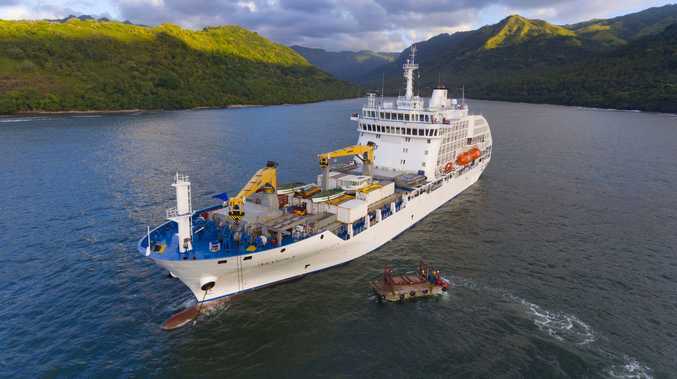 While the Aranui 5 workers go about their work unloading cargo for the remote archipelago, passengers go on shore to experience the beauty and history of the islands. Back on the ship workers busily unload cargo for the islands and collect local produce for shipment to other islands. It is fascinating to watch the cargo being lifted on and off the ship, using onboard cranes to load up the island barges. The Aranui five features a restaurant, two conference rooms, lounges, a library, a boutique, a swimming pool, a gym, a spa and four bars including the popular Sky bar. The food on board is magnificent cuisine complimented by French wines. The first two voyages in 2020, departing on February 6 and 22, are being offered at a discount. An ocean view stateroom starts from $6030 per person twin share and a royal suite from $8970. Seniors are also being offered a discount across all cabin categories on the September 10 departure voyage. For more information, go to www.aranuicruises.com.au or phone (03) 9449 3778.